Mark Bangs of Lacon, while on a business trip to Springfield in 1852, wrote a letter to his wife Nellie, describing his trip and giving his impressions of the elite American House Hotel, the largest in Illinois at the time. The American House was on the southeast corner of Sixth and Adams streets, across the street from the state Capitol (now the Old Capitol). It had been built by Elijah Iles in 1837. 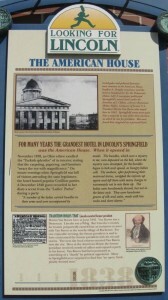 Former president Martin Van Buren stayed at the American House during a visit to Springfield in 1842, and the hotel also was the site of the first professional theater performance in Springfield. A Looking for Lincoln marker identifies the location now. 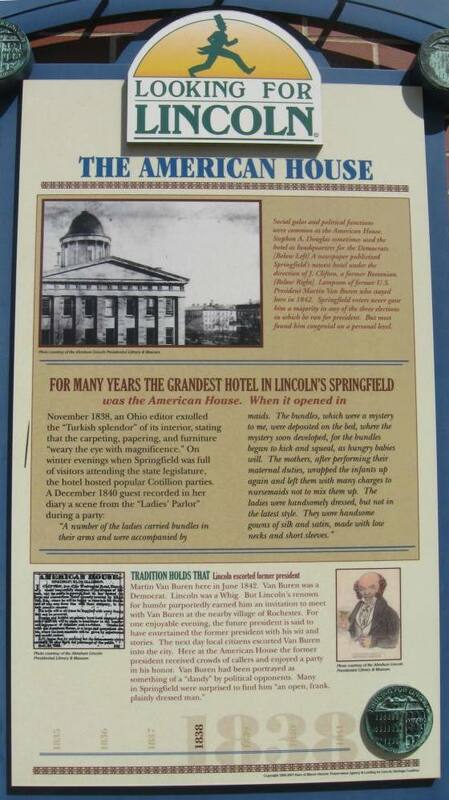 Below are excerpts from Bangs’ letter, as published in the March 2009 edition of Historico, the Sangamon County Historical Society newsletter. Now I want to set down in our little home in Lacon and relax myself. As can be done only in the society of a bosom companion. The gray evening closes stealthyily and passively over this muddy city. The footfalls and clatters in the street have assumed a homeward sound … The fact is I have been perambulating the muddy streets of Springfield for a good part of the day; thinking of a great many things. The gong says come to supper – please excuse for a little while I take a little corn bread and a cup of tea and maybe my ide will be brighter. A desideratum certainly – you will say – maybe “Rather a long supper” I seem to hear you say, well it was somewhat elongated, I confess. That roast potatoes and that corn bread and that cup of tea – to say nothing of two or three yes four or five nice ladies who sat opposite me at table – were most decidedly satisfactory. You won’t be jealous now will you, for none of them looked half (to me) as attractive as your own dear self – of course I mean the ladies and not that roast potato etc. Wall we did get here last night but the mud! O’ my country!! For about ten miles after we left Middletown, where I wrote you last, the going was passably good – but the rest – 12 miles – into Springfield was beautifully muddy – Well we went 12 miles about 5 hours – Springfield is a mud hole and that’s a fact. What it is in a dry time I will not undertake to say – what it is in a wet time can be seen now but not readily said. I hope it may be better by the time we wish to leave it and wait with patience for the realization. Mr. Terrill and my humble self are very comfortably settled in the third story of the American; with a nice fire like unto that we had in Ottawa. Our room is very much such a room only a little narrower – two windows – one on each side of the fireplace, with a bed in either corner; two washstands, writing table, looking glass, 5 chairs, and a pair of other articles of chamber furniture whose great utility – particularly when in the third story of a great house in a muddy city – forbid a more particular mention. Mr. T. is taking a cat nap and Mr. B. is writing to his well beloved spouse. The dogs bark watchfully, within the servants sing and rattle the dishes in the dining room. Our cheerful fire laps its lithe flaming tongue smoothly around the ragged lumps of coal in the grate and purrs and putters as dreamily as a nest of kittens. I do love an open fire – so sociable, so quieting helps on a reverie so nicely. Hark! Here it rain? Well it has looked like it almost all the afternoon. I hope the bottom will fall out of the streets so as to let the mud dry up and this rain will help settle the roads. Do you distribute my love to all the good folks? Here’s more for distribution. I can safely trust it in your tried hands. Give brother the particulars with his share. This entry was posted in Hotels & taverns, Presidents, Prominent figures. Bookmark the permalink.